The fact is your business needs a mobile marketing strategy, regardless of the type of business you are in. The numbers don’t lie and that’s exactly what we’ll be analyzing in this article. 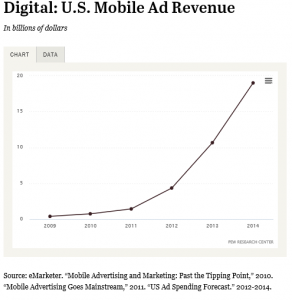 In 2014, $19 billion was spent on mobile advertising, up 78% from the $10.7 billion spent in 2013. This incredible increase is still far less than the increases in the past two years, which saw growth rates of more than 170%. 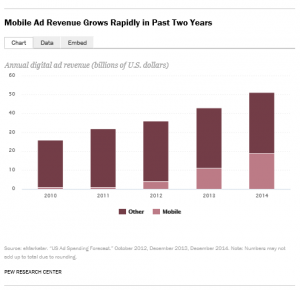 We have now seen that mobile ad spending accounts for 37% of all digital ad spending. That’s a 25% increase from last year. 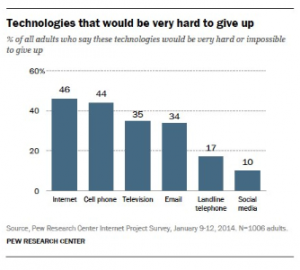 What are the devices and technologies your clients wouldn’t give up? The top two responses are the internet and their cell phone. This graph does not show this, but you can be sure that if you asked the same question to a group of adults, those numbers would be doubled. The younger a person is, the more attached to their mobile devices they are. These young adults are either your current customers or your future customers. If you understand their habits and how they spend their time, that information will be imperative in your future success. What is this graph saying? Well, generally speaking, any graph that looks like that is trying to tell you to pay attention. This one is saying is that you better have a mobile digital marketing plan, because your competition does. How do I develop a mobile marketing plan? Good question. We’ll start at the top of the list, but you’ll soon realize that many of these will be done concurrently. Is your website optimized for mobile? We’re going to assume that you have either done or are doing this. Oh, and make sure your site shows up properly on all devices, so this means you should be testing any and all devices. SEO your site with mobile in mind. It’s important to optimize your site with keywords that address mobile use. You should ask for cell phone numbers (opt-ins) so you can communicate with your customer’s mobile phones. So, don’t be afraid to ask on your website, on digital ads, and in-person. 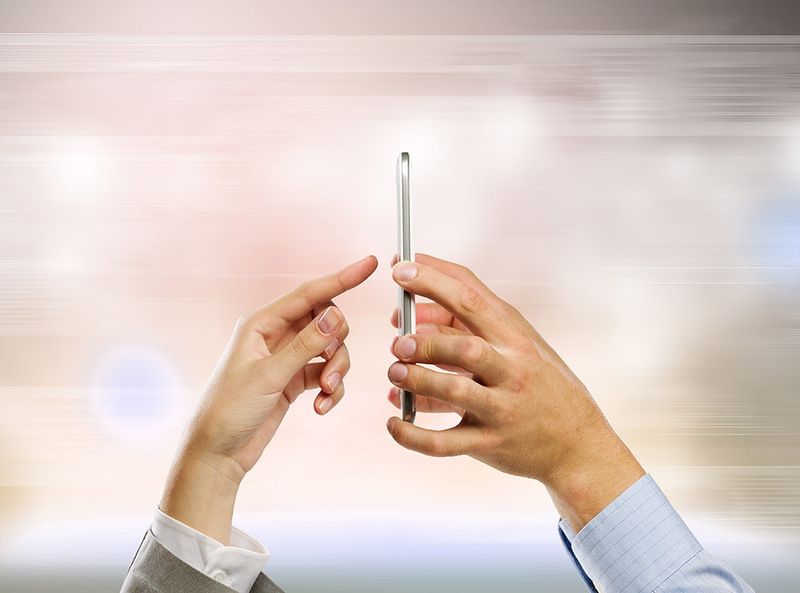 SMS is a growing communication channel as well, so prepare yourself. You should choose a marketing partner that offers dynamic number insertion (DNI) which provides a unique phone number for each campaign and comprehensive analytics after the fact that will allow you to review each campaign accurately and thoroughly. Who is your target market? You must identify them and learn about them. How do you reach them? When you do reach them? What offers appeal to them? Where are they when you are talking to them? What is your goal? Sales? Website visits? Sign-ups? You must determine exactly what the goal of each campaign is, because they may each have different goals. Digital ads: This is the broad category of ads that appear in the “digital” space, such as computers, phones, and other mobile devices, as well as other types of ads, broadcast (radio and television), print (newspaper and magazine), and outdoor (bus backs and billboards). Geotracking: This is perfect for retail shops and those whose customers are within a limited geographic range. This will only allow ads to appear to people within a certain geographic range. In fact, digital display and PPC can both be geotargeted. Retargeting: If you have ever visited a website, let’s say Home Depot, then went on to visit another website, only to find Home Depot ads following you around, that’s retargeting. It’s effective. The point is to drive people back to your site and it works best when people are shopping. The hope is that you will decide that what you saw first was your best choice. PPC: This is the simplest of all ads. The customer searches for “Los Angeles, payday loans” and search ads appear that are triggered by the keywords. If the customer clicks on the ad, they pay the search engine a previously agreed upon price. PPC can be a very effective tool in your mobile marketing toolbox. It’s great for auto-related emergencies, such as towing. SEO: This is not necessarily a “paid” form of mobile marketing, but an extremely important one. SEO is the science of telling search engines what your website is about. It’s imperative that through the use of keywords, metatags, photo descriptions, and other pieces of code, that you tell the search engines what each page of your website is about. If you fail at this, customers will not be able to find your site. 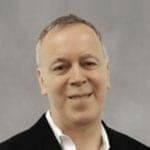 Click-to-call: This is becoming a more important tool to marketers with each passing day. It’s used by restaurants on mobile ads so that you easily call them to make reservations. It’s used by plumbing and heating contractors for emergency situations. It’s an effective way of having people contact you. What’s the message? What words/offers appeal to the target market you are after? You can narrow this down and test them. Google and Bing both offer A/B testing so that you know which search ads and campaigns are working. You can choose a different phone number for each campaign. The good news is that in a month or so, you’ll have analytics that will tell you which campaign delivered the results you were looking for. What happened? You can use your analytics not just to see which campaign converted better, but take a step back and see if the results change a presupposition that you had. Is there something that you thought that was fact, but it turns out is no longer true? This is an instance where a thoughtful review of your analytics will go a long way to growing your business by helping you make the right marketing decisions. Mobile Marketing is the present and future. The key to your success is to start thinking from a mobile perspective. So, start thinking like your customers who are holding a cell phone when they call you and it’ll change your marketing.